Granted, ‘Karen’ needed a good selection of smart office wear. Her role meant that she was often found presenting to large teams of people. Her interpretation of the required dress code was to buy pretty much any workwear she saw in the shops, especially if it was reduced. The result was a load of mismatched pieces, many of which she never wore, and a very confused wardrobe. This meant that mornings had becoming increasingly stressful. Trying to create the right outfit for the day took waaay longer than it should and seeing all the unworn and discarded items strewn on the chair, (and bed and the floor) as she tried things on gave her those horrid guilty feelings. You know the ones? They come with the realisation of the accumulated cost of SO many ‘unsuitable’ pieces. ‘Karen’s’ main clothes buying policy was two-pronged: Buy lots and buy cheap. This policy sucked. To add fuel to the fire, the seemingly never-ending sales periods (once reserved for end of season and January only), meant that ‘Karen’ could pretty much always bag herself a bargain. Only they weren’t bargains, were they? They were unnecessary and unhelpful items that were clogging up her wardrobe and making it even more difficult to get dressed each day. They created confusion and clutter and made her feel bad. Buying a piece of clothing because it’s reduced, is not the best way to fill your wardrobe. We all love to save a few pounds here and there, but if price is the only reason for the purchase, it’s unlikely to be a goer. A wardrobe stuffed full of discounted pieces with the labels still attached is in fact a HUGE waste of money. Have you ever calculated how much money you have wasted on ‘bargains’? Probably you’d rather not. It doesn’t feel good. But it might just get you to change your own clothes buying policy for the better. If you decide when, where and how you are going to wear a piece (whether it is reduced or not), it is more likely to slot nicely into your wardrobe and serve you well for years. I have my own policy for clothes purchasing which I am very happy for you to adopt. My policy doesn’t stop me from frequent shopping (hey, it’s my job! ), and I do have rather a large wardrobe (again, it’s my job), but my policy ensures that anything I do purchase will be loved, work well with existing pieces and will be worn enough times to warrant the investment. I have to love a piece regardless of the price. This means that in theory I would’ve been prepared to pay full price for it. It has to suit me! The colour, shape, style and scale need to work for me. It has to fit me well, or be easy to alter. It needs to make me FEEL good. Give it a go and see what changes for you. And don’t forget to leave me a comment. 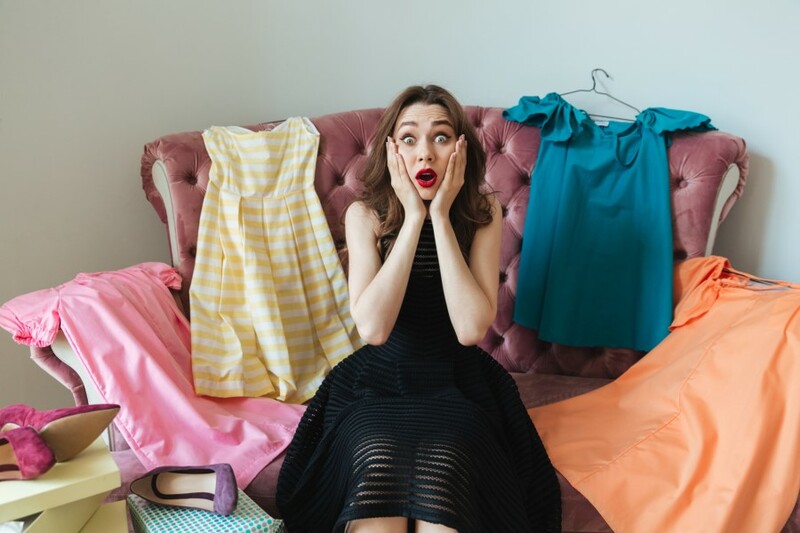 Do you have your own clothes buying policy that works? Or do you need to stop and think before you snap up your next ‘bargain’? I’d love to hear from you. I no longer buy ‘bargains’ and they’re not cheap either when bought in bulk. Over time I began to feel like the ‘bargains’ that I bought were the clothes I wore the least and I felt guilty. I decided, rightly or wrongly, that discounted clothes are second best because if no-one has bought them so far, they are clearly not that great. It’s a huge generalisation, I know, but somehow I feel much better when I buy something that feels 95-100% right even if more expensive. It’s such a luxury to feel good in clothes. I was determine to respect my peace of mind and learnt how to live with the little (turns out temporary) grief and disappointment when the item just didn’t look right on me when I tried it on. 80% satisfaction is not enough anymore, there are enough clothes around us to find something absolutely marvellous and bargains are hardly ever that. Great reminder Helen, thank you. I love that Agnieszka! 80% satisfaction is not enough any more. That is a great quote. Thank you for your comment and sorry it has taken me so long to reply!